Feel like singing and dancing down a mountain that once served as an Air Force radar site? Mambo Alley, a long serpentine beginner trail, lends itself to both — depending on the vocal and agility ability of its skiers and snowboarders. Snow sliders of a certain age who enjoy Perry Como’s popular recording of “Papa Loves Mambo” on golden-oldie radio stations may find themselves singing the lyrics as they sway to and fro down the mountain. Snowsports enthusiasts with freestyle skills and twin-tipped skis may treat Mambo Alley as a linear ballroom by doing 360-degree turns and other dance routines. There’s plenty of room to do so on a run that’s almost 2 miles long. You’ll feel like a comet if you point your skis or snowboard straight down and schuss Comet, a slope that’s rated intermediate at the top and beginner for the lower two-thirds of its length. Watch out for wobbly novices emerging from the Voyageur trail onto the lower section of Comet. Forego the urge to take the plunge from the top and enjoy this slope to carve consistently controlled turns. Catch Comet as soon as the North Summit slopes open, especially on weekends. You’ll get more runs in with minimal waiting in the lift line for the four-person chairlift. Hank Parke, son of resort founders George and Helen Parke, said he and his sister and parents used the automobile section from the Sunday Pittsburgh Press to select the names of their slopes and trails. Lower Wildcat can take a bite out of the best of skiers and snowboarders if they don’t pay attention to its edge-catching double fall-line, especially when it’s dappled with moguls the size of Mini Coopers. The slope isn’t that big — a couple of football fields long — but it has served as a rite of passage for local and regional snowsports enthusiasts for years. If its challengers can ski or snowboard Lower Wildcat — in complete control — from its top to the bottom near a cabin-sized boulder, chances are they can handle anything. People who fall should be prepared for a long slide if they don’t immediately self-arrest by braking with their boots, skis (if one or both are still on) or ski poles. The trick is to grab the poles just above the baskets and dig in the tips. Laurel plans to reopen in December. The accent is on edging on this hard-pack expert slope at Seven Springs that is named in honor of Lars Gunnar (pronounced GOO-nar) Skylling, who retired in April 1997 as the resort’s director of skiing and snowboarding. His daily recorded snow-condition reports, delivered with a Swedish accent, charmed callers for decades. Start out slowly. With its 3,009-foot length and 750-foot vertical drop, Gunnar can easily run away with you because it’s too easy to exceed your comfort level. 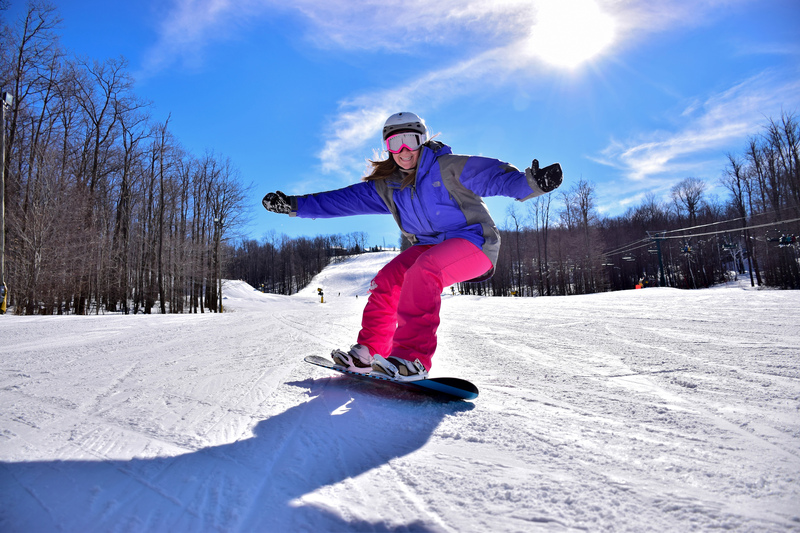 Look for loose snow on the edges of the slope that make it easier to carve your turns and control your speed. The high-speed six-passenger chairlift, nicknamed “The Six-Pack,” will whisk you back to the top in a few minutes. The lift also serves three trails rated expert and two beginner trails. Ace’s Run, an intermediate slope at this Western Maryland resort, borders the far end of the North Camp area. To be one of the first to get there, line up early for one of the paired triple chairlifts known as Chair 2 and Chair 3. Use your poles — or your free foot to propel your snowboard like a scooter — to reach the top of Little Dipper, a beginner slope usually groomed for confident cruising comfort. Traverse to Chair 7, a quad, and enjoy run after run down Ace’s. Don’t be surprised if you — and a few others — have the slope and the chair to yourselves for at least the first hour. The run lends itself to carving slalom and giant slalom turns at various speeds — but control your speed. Wisp draws 100 million gallons from Deep Creek Lake each season for its extensive snowmaking system.